This is mostly for me. I showed the title of this post to my husband and he told me nobody would be interested in reading a manifesto. And that’s ok. Because I wrote this as a guiding post for me. I need to articulate my fundamental beliefs about food and nutrition so I can make sure everything at Smart Nutrition aligns with that! I believe that eating was meant to be a joyful experience, shared with family and friends. I believe that food was meant to be delightful and full of flavour. If the only reason for food was sustenance, God would have just given us boring old manna. I believe that healthy eating can fit into anyone’s budget. I believe that our bodies’ signals are the most finely tuned way to know how much food to eat. I believe that eating food close to the way it was grown is the most healthful. However I also believe that a food or ingredient shouldn’t be feared simply because it was manufactured. I recognize that optimal nutritional status may sometimes need to be met with supplements, but I believe in turning to food first. I believe that all people should acquire basic cooking skills. I believe our bodies’ were designed to work optimally with the ebb and flow of regular meals and snacks. I believe that fruits or vegetables should make their appearance at every meal and snack. I believe that ice cream and chocolate are basic necessities of life. Do these resonate with you? 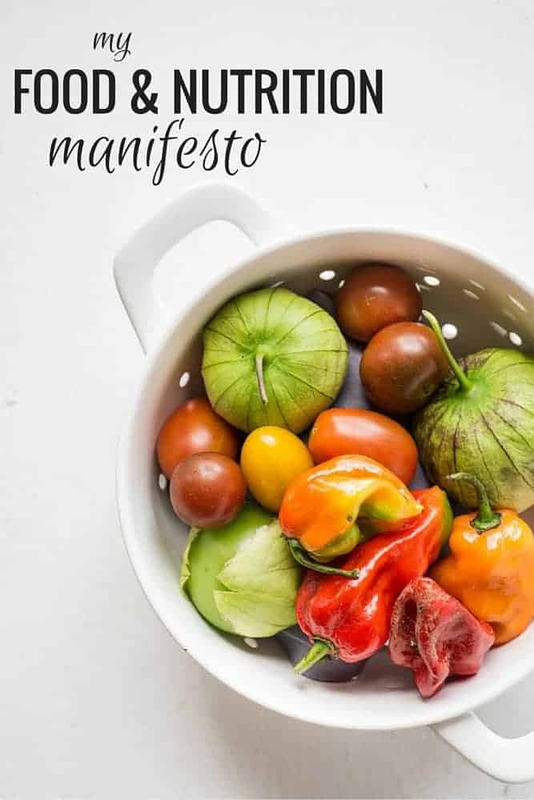 What would you include if you had a food manifesto? I love this manifesto! It’s very similar to what I imagine mine would be if I set it down on paper. #9 is something I believe but definitely do not practice, especially for breakfast, and which I’d like to work on. I’d love to hear of any neat tricks/quick ways of doing this in a pinch if you haven’t already covered it! Yeah, breakfast is the biggest struggle for me as I rarely get in fruit or veggies. We did just sign up for CSA boxes so I’m excited to try some new things. This list is great. I just need to get in the habit of doing them! Funny how many of the things aren’t actually hard or time-consuming, just not the way we were raised. And it’s amazing how much of our food habits are “unconscious” even when we think that we give food a lot of thought. I’m glad you shared this post, Jessica. If I had a manifesto, I think most of it wouldn’t even make sense; where would I begin? One thing is for certain, “all foods fit, all”. “Eating doesn’t just define your physical health. It goes beyond preventing heart disease, getting enough of a vitamin, or having a healthy weight.